Pioneers in the industry, we offer spark erosion oil and sparking oils from India. Our immense industry experience and in depth technological expertise of supplying, trading and subdealing in an impressive array of premium oils has enabled us to offer Spark Erosion Oil with low viscosity and is exclusively developed for long functional life for impeccable flushing, finishing and shining operations. It facilitates rapid carbon settling and does not cause itching of hands. We observe rigid norms of quality and offer the same in different packaging specifications. 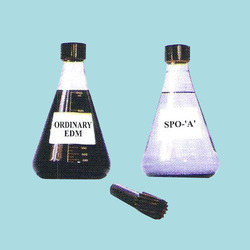 Offering Dnr Spark Spo A Long Life Edm Oil Sparking Oil Die Electric Fluid. DNR Spark SPO-A is a high quality, low viscosity dielectric fluid designed to perform flawlessly over a broad range of metal removal rates. The low viscosity of DNR Spark SPO-A provides uniform cooling of both electrode and workpiece while allowing rapid settling of the metal particles. It works as an insulator but deionizes quickly, at applied potentials, to conduct the spark discharge. 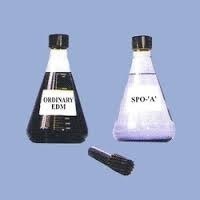 DNR Spark SPO-A is a dielectric fluid for general purpose mold and die work where good flushing, close tolerances and optimum rates of metal removal are important. It widely out-performed the common EDM fluids more than tenfold in oxidation stability characteristics, sludge formation and service life. Looking for Spark Erosion Oil ?